In this very depressing episode, the 7 year old son, who is witness to his mother’s constant torture – done by his father, helps his mother escape the demon! The little boy was asked to write an essay on ‘My Family’ and he writes the whole truth – in broken English – about what happens at his house, how he is beaten, how his mother is beaten for small issues – everything. The teacher is surprised to read such revelations and she shows this to the head madam and asks her if she can report this to the cops? The head madam asks her to first call both his parents to school. In the PTM (parent teacher meet) they confront both the parents about why the child wrote this and that they should immediately take steps to solve the bitter home scenario. The teachers had been observing him for long and had noticed that he was always fearful and never mixed with anyone! Father returns home and starts beating them up again. The wife then takes a stand and reports to the cops. She then leaves him and goes to live with her parents along with her son. The daughter – who was also the only daughter of her parents, had approached her parents for help and had requested them to let her live with them. The mother had refused to accept her decision and asked her to adjust with her DEMON husband! As parents, you must give full support to your children even after their marriage! 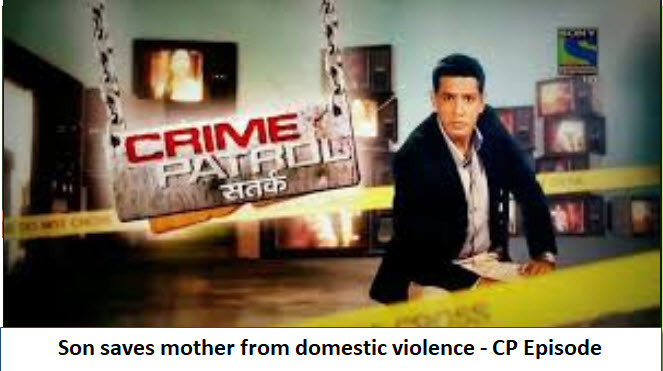 When daughters report of domestic violence, immediate steps should be taken to correct the situation. But in this case the mother allowed her daughter to be tortured for 8 long years! In the episode it was shown that the husband mostly lost his cool because of her mediocre cooking skills! He was shown throwing the plates and screaming at her for bad cooking! What is the solution to this? Either keep a good cook or, if money is the problem, then teach the wife to cook well! The husband or her parents could have sponsored her cookery classes! Her husband could have been admitted to some Anger Management Institute under some therapist! Well all such suggestions are rather clichéd! Nothing works it seems! Just nothing…what can be a possible solution? Any suggestions?